* New topic: Down's syndrome and Ginkgo. * New topic: Christian Dior fashion spring 2007: dress with Ginkgo leaves design. Hi there, I would like to try to grow my own Ginkgo. Is there anybody who can spare some seeds. I will gladly pay for the postage . I live in the Netherlands. You can contact me on my email account harrie_tjoelker#hotmail.com , you need to exchange # with the @ sign. In South Korea Sungkyunkwan University has on its campus two large trees (Monument No. 59). Planted in 1519 by Yun-tak (ex-president of the Old Sungkyunkwan). They hold symbolic meaning in Confucianism because Confucius is said to have loved reading, pondering, and teaching his disciples under a Ginkgo tree. These trees also represent longevity and enlightenment, both held important in Korean culture. 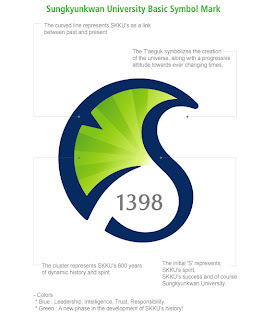 The University has the Ginkgo leaf as its symbol (click on picture to enlarge). * New topic: China's terracotta army and Ginkgo pollen. Is there a commercial market for growing ginkgo trees in new zealand. If so we would love to hear from you. Topic by Keagan John Mason. 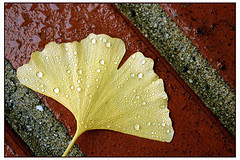 This is a beautiful photo of a Ginkgo leaf after a rain made by humminggirl. Here is the original photo and text. * New topic: Arbor day 2007.